I’m always given a bit of pause when going for a sandwich at an establishment named for some other food. Plenty of such establishments offer fine sandwiches, but it’s always cause for the tiniest bit of suspicion. I should have trusted my instincts. 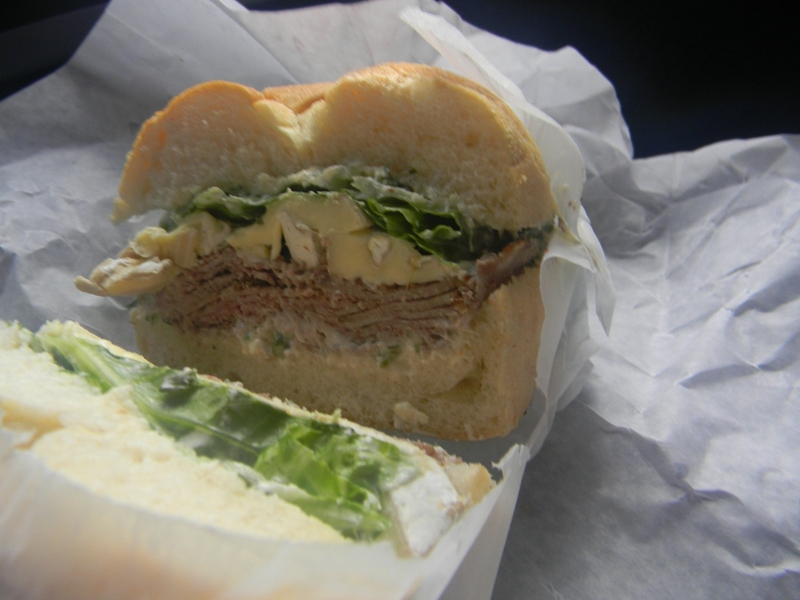 The French Bull at Bagel Maven is roast beef, brie and watercress on ciabatta bread. Mayonnaise and horseradish round things out. That’s well and good in concept, but in execution there was much too much cheese. Believe it or not, what you see above is merely half of what was intended for the sandwich, and I actually broke with my own policy and offered instruction to the man assembling things. Watching it being made, I saw the pictured amount of cheese added and then saw the sandwich maker reach for anther handful. I found myself unable to hold my tongue. “That’s enough cheese,” I called, and the woman behind me wondered aloud just how much he had intended to add. That will forever remain a mystery, but I do know that so long as I was shouting instructions I should have called for some subtraction. The beef and the cheese are there in almost equal parts, which is hopelessly out of balance. The horseradish was completely lost, something that happens a lot more frequently than I would prefer. In more fitting proportions I think this would have been a fine sandwich, but as I received it it was no good. Balance is delicate, tremendously delicate, and it’s all too easy for one element to derail a sandwich. Any serious sandwich enthusiast knows this, which makes it all the more a shame that so many establishments seem so set on reminding us. From time to time esteemed members of the larger community of sandwich enthusiasts have a tale or idea too good to be kept to themselves or only shared privately. In these instances, On Sandwiches is happy to feature these contributions. In this case, Sarah Sprague brings a story about weary eyes and the saving grace of sandwiches. 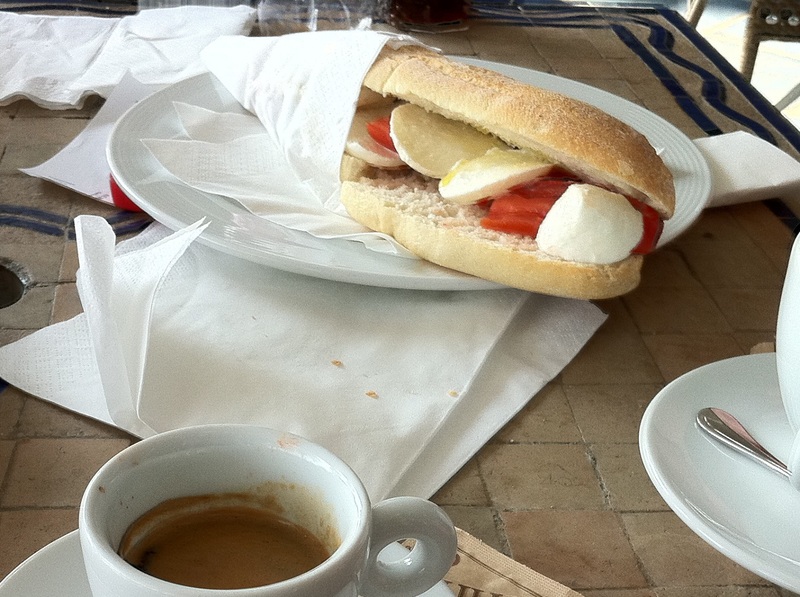 By the time we reached Italian coast I hadn’t eaten a sandwich in nearly two weeks. I had seen beautiful over-stuffed sandwiches in the food halls of Harrod’s back in London, packaged sandwiches on the Eurostar as we sped through France, sandwiches with rich cheeses in Brussels, sausages with dark bread in Prague, ham with mustard in Switzerland and Austria, and all matter of stunning looking sandwiches at the gas stations along the German Autobahn; the latter being most curious to me, as it was nothing more than a market at a rest stop and yet there were these buffets of fresh sandwiches on display, allowed to breathe the fresh air and not wrapped in suffocating cellophane like I was used to seeing back in the States. They were the most appealing looking sandwiches I had ever seen in my life. We were about thirty minutes away from our destination when we stopped for fuel at a roadside station in Italy. In the shop they were making all sorts of sandwiches for the truckers, each one made to order. We had left Luzern very early — my associate and I had actually stayed up all night watching the final night of the MLB regular season as it went down the wire — with nothing more than a cappuccino and the Tolberone mousses we had indulged in for breakfast filling our stomachs. Upon seeing the sandwiches in the Italian rest stop, I knew I needed to take a stand for our lunch and my sanity. Traveling with other associates can be difficult. No one wants to impede on their companions’ usual routine. Traveling with your associate-in-laws can be even more difficult. No one wants to offend anyone, nor do they want to disturb any sort of trying familial dynamic. When my associate and I travel, we believe in big breakfasts, a snack — often a shared sandwich, and then a light dinner. This trip had been one large sit-down meal after another and both my associate and I were reaching our breaking point. As we walked back to the car after peeking in the shop, we agreed; we needed a sandwich for lunch. We knew were not going to be able to eat at the rest stop, but maybe once we got into town, we would be able to suggest we take it easy for our next meal. It was unusually warm fall day, better suited for the busy August vacation month which made our little empty beach side hotel seem like a steal. Their restaurant was closed until evening, but the beach stand was open. A break. Everyone was tired and needed to refuel, the idea of roaming around was unappealing to the associate in-laws. Another break. The beach stand served fresh sandwiches. I could have hugged the woman at the front desk. By the time my associate and I had put away our bags and changed into lighter clothing, the associate-in-laws had already found the snack stand and were halfway through their lunch. I saw prosciutto and I saw bread on their plates. I couldn’t wait to stare at the menu board for myself. Tomato and mozzarella sandwiches may be one of my favorite sandwiches. Sometimes with pesto, sometimes with olive oil, basil, no basil, cracked pepper, no pepper. They are simple and comforting while being very dynamic on the palate; they are filling without weighing you down. Of course that was what I was going to order and share with my associate. A sandwich to calm both our nerves and our stomachs. This tomato and mozzarella sandwich came with just a light drizzle of olive oil and was served on one of the most satisfying breads I have ever encountered. A flaky crust gave way to a chewy middle layer with a soft center. The tomatoes ripe and flavorful, juicy without being watery and tasted tart and sweet. Mozzarella was creamy with just a hint of salt. The olive oil gentle rolled between bread, cheese and tomato on each bite, its nutty richness working as the bass line to the other ingredients’ higher notes. While I ate my half of the sandwich, I wanted nothing more than skip the rest of the trip and stay at the little beach hut for the remainder of vacation. We got back to Los Angeles about a week later. It was still warm, but I knew my days of seasonal heirloom tomatoes were numbered, even here in California. I wanted to recreate the magic of the day on the Mediterranean, but if I waited too long it was going to gone. I bought bread from one of the city’s finest bakeries. I went to two cheese shops before I felt I had suitable mozzarella. I found the nicest smelling tomatoes. I pulled out my finest olive oil and I made us sandwiches. They weren’t nearly as good as the beach stand sandwich, nor have any other tomato and mozzarella sandwiches been since our trip. Some time ago I made a kimchi grilled cheese that involved two types of cheese and an additional layer of macaroni & cheese. I found it to be a delectable sandwich, and it quickly received a place in my regular lineup of sandwiches that I may make as the mood strikes. The only issue is that macaroni & cheese is not something I regularly consume, and if I’m just trying to put together a quick sandwich I’m unlikely to cook up a whole pot of it. Even when simply using what is on hand, though, the kimchi grilled cheese has treated me well. Even when not great, it rests comfortably at good. If it sounds like something you might like, I give it a strong recommendation. As with any sandwich one makes regularly, there’s always a bit of tinkering going on. Most recently, I had some bacon on hand and decided to see how it would fit. I fried up a few slices and added them to some minced kimchi, provalone, and smoked gouda. (The macaroni & cheese was absent for the reasons mentioned earlier.) The resulting sandwich was a bit surprising, in that it wasn’t particularly great. Good, but not great. I’m not one of those persons who wants to take a slab of bacon to bed with them, but I’m not going to deny that it is a mighty tasty, fairly powerful item. And yet, in this sandwich it didn’t make much impact one way or the other. You could tell it was there, but it hardly shined. I imagine I’ll make this sandwich again before too long, and when I do I won’t be wasting any time or bacon when I know it won’t make a difference. A couple of weeks ago, my closest associate suggested grilled cheese sandwiches for dinner, and of course I agreed at once. 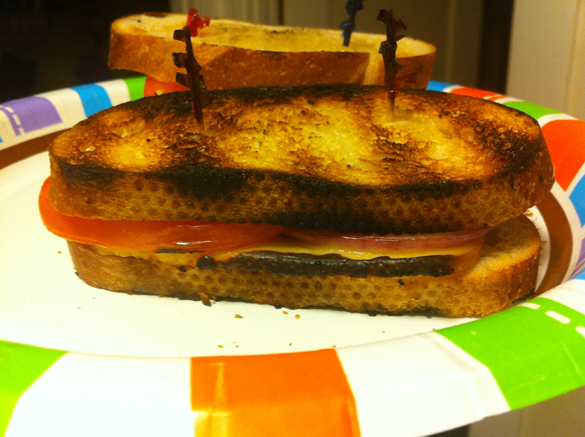 After preparing the ingredients, I learned that the sandwiches were intended to be grilled…on a grill. I was game, of course, but very intrigued as to the result of a grilled cheese sandwich prepared out-of-doors. I am extremely pleased to say that the results were very pleasing indeed. The bread had ample crunch, the red onion had ample snap, the smoked Gouda was neither too mild nor too overpowering, and the fresh tomato added just a bit of sweetness and moisture to the affair. Of the two sandwiches I consumed, the crisper of the two was preferable. All in all, a worthwhile experience that I heartily recommend. Ah, the prepackaged sandwich. I stood in line at the student bookstore, holding this item, and for the life of me couldn’t understand why. Purchased on a whim, I knew, with certainty, that I was in for an absolutely dismal experience. Visions of my colleague’s recent nightmare raced through my head. Here, however, is our lesson for the day with regard to sandwiches. The lesson of experience surpassing expectation. It does not happen often. All too often, the sandwich falls well short of its potential, or is precisely what you expect, which is its own specific kind of disappointment — the disappointment of mediocrity. 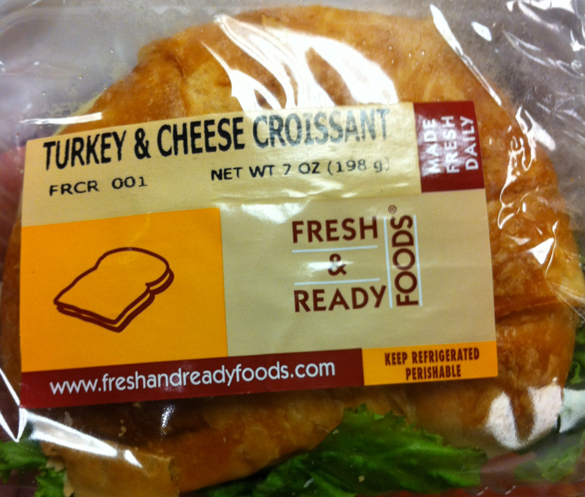 When I opened this sad little package, I was surprised by two things: the first was that the croissant was moist and flaky, rather than the dry and crumbly mess I anticipated. The second issue was the cheese. I had expected — nay, known — that there would be one horrifying square of freakishly orange cheese topping off the affair. Imagine my shock when I saw instead a large, oval slice of what appeared to be genuine provolone — or near enough, at any rate. This sandwich, as with my recent experience at Billy’s was packaged with a packet of mayonnaise, and a packet of mustard. This, of course, is the standard for boxed sandwiches. The sandwich was not bad at all, much to my endless stupefaction. Certainly, this was far from a “good” sandwich, but when one’s expectation is set at a 1, sometimes a 4 or 5 is heaven on earth. I have looked at the Bay Area cheese steak before, and I found it lacking. 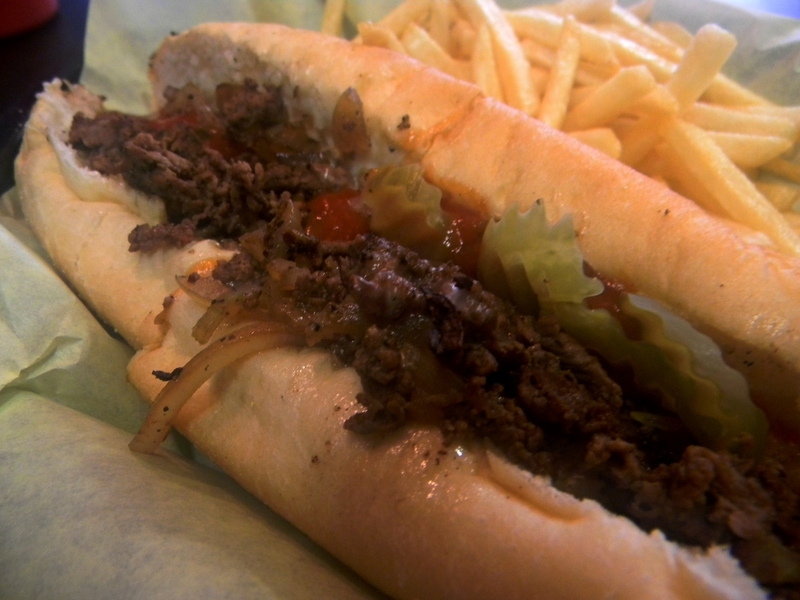 Philly Style Food is a more recent addition to downtown San Jose, and it sits almost directly across the street from the Cheese Steak Shop. It’s hard to imagine it is anything other than a direct challenge, a move befitting an establishment bearing the colloquial “Philly” in its name. Aside from the name, though, Philly Style Food makes no additional boasts of authenticity. There is no note on the origin of the bread, for example. It seems they are content to let the food stand on its own; it will either pass as Philly Style or it will not. I wish I could offer you a verdict there, but I fear they walk a line so narrow it would take a local to make a fair ruling. I have walked Philadelphia, friends, but I have not lived it. The sandwich featured what I know of a cheese steak sandwich; beef was thrown a flat top with onion, minced fine, provolone laid on top to melt. After placing that in a roll, pickles and ketchup were added, and that’s where my knowledge fails. (I had, as is policy at On Sandwiches, replied to the standard “Everything on it?” with a simple “Yes, please.”) Pickled and ketchup aren’t completely out of place on a cheese steak, but they’re not part of the traditional, classical concept, and more than that I could have sworn that that sort of sandwich hailed from some other part of Pennsylvania. In short, it seemed to me that a sandwich distinctly billed to be Philly Style was exactly the opposite. But I cannot say for certain, and so I will reserve judgement on the philosophical component of the sandwich. What I do feel qualified to rule on, though, was the quality. It was a fine sandwich. 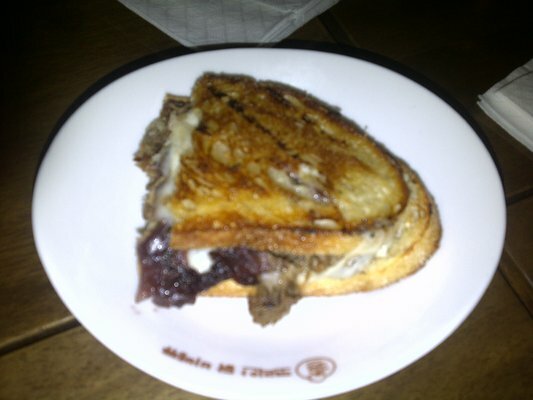 The cheese melted all the way down, mixing in with savory beef and well cooked onions. The roll had a nice chewy crust and the ketchup wasn’t so sweet it took over the sandwich. So while I may not be able to say with any certainty whether or not this was strictly Philly Style, I can assure you that it was a tasty sandwich. In direct contrast to the quad deck from Beer Belly, the short rib grilled cheese at Biergarten goes to work with minimal cheese and maximum short rib. Rather than letting the non-cheese materials be swept away, they’re highlighted. The whole thing comes off more like a melt than like a grilled cheese, much to its benefit. I apologize that it doesn’t come across in the photo, but the sandwich is packed with tender shredded meat that’s tossed in a bit of sweet sauce, playing wonderfully against the cheese. The sandwich is crisp and not too greasy. Thinking about it, I suppose I might feel differently if I came in looking for a grilled cheese, in a sort of inverse of the Beer Belly situation. There I looked for moderate cheese and got too much, here someone else might look for copious cheese and find too little. Ultimately it’s something that can only be settled by each enthusiast on their own terms. On this enthusiast’s terms, I will say, this was a delightfully nimble sandwich in a world full of lead-footed dunces. 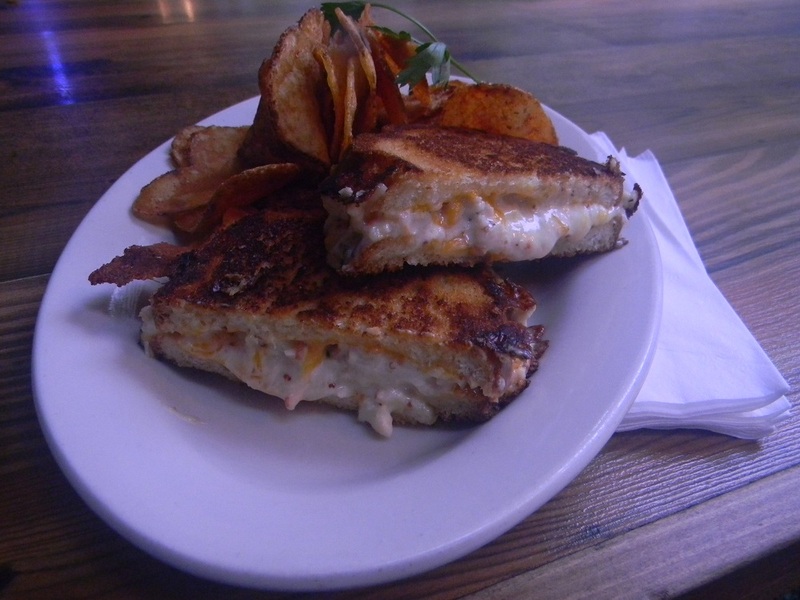 Any sandwich enthusiast who takes a wide survey these days is bound to find a good number of grilled cheeses. Somehow they’ve caught fire and everybody wants to try their hand at some monstrous tower of cheese. For their part, Beer Belly offers a “quad-deck 4X4,” essentially two standard sandwiches melded together via more cheese. All told, it features cheddar, gruyere, asiago, and goat cheese. There’s bacon and maple syrup in there too, and why not? So many of these grilled cheeses set out not just to gild the lily, but to set in a few precious stones and then have the whole thing bronzed. Now, I have no philosophic objection to the ostentatious. But intention will always come second to execution, and when it comes to this quad deck I’m staying in steerage. It’s entirely too much cheese, with the asiago standing out mostly by virtue of an overwhelmingly grainy texture. The bacon is there because it’s the kind of thing one adds to signal a sandwich of supreme decadence, but it’s just lost in the cheese. The maple syrup, meanwhile, isn’t lost so much as willfully buried. I took to dragging the sandwich through the drizzle left on the plate, hoping to gain some sense of what the sandwich was supposed to taste like, in concept. It was no use. This was a poorly thought out shot at the moon, a sandwich assembled without sense or care. I appreciate a sandwich that wows me, but one that bowls me over is a bit too much. Every truly great idea begins with but a germ of that idea, and perhaps this meager sandwich can serve as a jumping-off point for further experimentation at this humble blog. While preparing a box of “homestyle” macaroni & cheese for dinner (“homestyle” is the type that comes with a small packet of bread crumbs for sprinkling atop the finished product), I decided to make it a slightly heartier meal by shredding a quantity of deli turkey into the mixture. As I prepared to spoon the finished product onto my plate, I realized this might actuality be an opportunity for sandwich making. 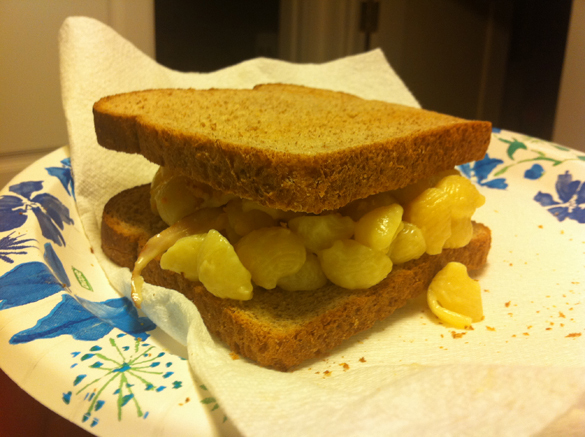 Unfortunately, due to available materials, said sandwich would have to be a couple toasted slices of whole wheat bread, onto which the turkey mac and cheese was foisted and bread crumbs added from their packet. The end result was pleasing, but obviously, sorely lacking. I feared the bread crumbs would be lost at best, and wholly unnecessary, but they provided a pleasing added crunch and grit. The turkey married well with the mac and cheese. 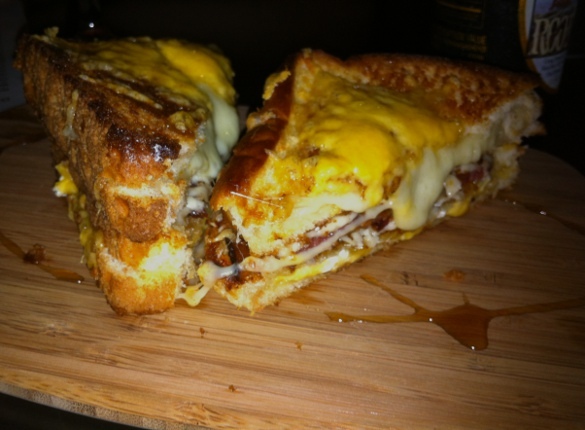 If I were to do this again, it would certainly be a grilled cheese sandwich. But it needs something more, and it’s my duty to determine what that should be. 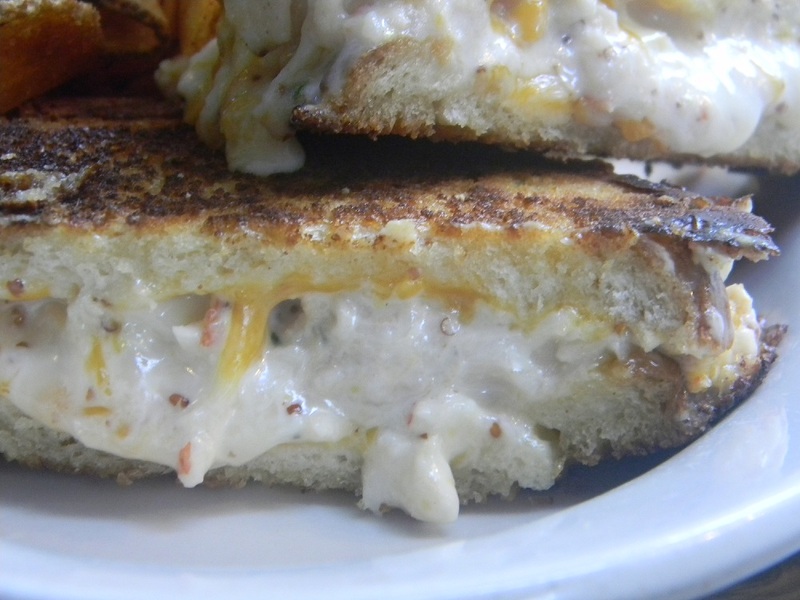 The Lobster Grilled Cheese at LA Cafe is $9.99. That’s the tell. The price of lobster fluctuates, of course, so with something that doesn’t go for ‘market price’ the only thing a restaurateur can do to protect their margins is to fiddle with the amount of lobster involved. Priced somewhere around $20 you might be confident you’d get a fair helping of lobster, but at $9.99 you know you aren’t in for too much. I still wanted to see how the whole thing worked, so I ordered it anyway. As an ordinary grilled cheese sandwich this would be a strong success. The bread had a wonderful buttery crunch, the cheeses used played together well and brought a smooth flavor with just enough tang. Everything that needs to work in a grilled cheese worked. But the inclusion of lobster makes it an upscale grilled cheese, and by those standards it’s a failure. The lobster, first and foremost, was lost in the cheese. Without substantial, meaty chunks the subtle flavor of the lobster was completely overwhelmed, leaving you to suss through each bite, hunting for the lobster purely by texture. It was there, but with a few exceptions it was diced too fine to stand out. That, I imagine, is a product of there not being enough of it – forced to use a small amount and wishing to distribute it throughout the sandwich, small pieces are the only option. I found myself wondering if a handful of large chunks could have stood with some filler. Had I gotten a sandwich with a few large chunks of lobster and some artichoke hearts or mushrooms, would I have felt cheated? I suspect I would have considered it fair, given the price. Another option might have been dressing the lobster in lemon before adding it to the sandwich, hoping the citrus would cut through the cheese and let flavor of the lobster shine through. In any event, neither these remedies nor any other were present in LA Cafe’s Lobster Grilled Cheese, and so I cannot call the sandwich a success. It would work very well if you did more to highlight the lobster or if you removed it entirely, but as it stands it misses the mark. This sandwich stands as a strong example of what I’m talking about when I say I don’t hold it against someone for aiming high and falling short. Someone clearly wanted a grand sandwich here, and by one constraint or another they were prevented from achieving what they set out for. I wish them better luck next time, and I make no strong mark against them in my book.